I want to thank Nick Vacco and his entire team for this great weekend. You can tell that Detail King is committed and is enthusiastic about the Auto Detailing Industry and helping others either entering into it or in my case already in it. It was a weekend filled with information – Nick and Paul’s perspectives on creating business plans, marketing, retaining customers, following up, etc. was spot on. I will be certainly changing some things in my operation due to the fist day seminars. The second day was spent in the ‘shop’ on exterior detailing – Nick came through with two rather beat up and dirty SUV’s. Again looking around the shop you can see the passion not only by Nick but by the entire Detail King Team – it is organized and spot less, and things just happens among the staff without very little discussion. The environment inspired me to implement a few new procedures in my operation. It was interesting to follow the exterior detailing procedures and to be able to use some of the DA polishers that I have not used before. The instruction was great – we worked in groups of 4 people and had 2 instructors per group, and there was plenty of detailing equipment for everyone to be able to spend time with it. Day three was spent on Interior car detailing – similar to day two, it really drove home to me the importance of having standard operating procedures in your operation – this is SO important to create a consistent product for your customer. Speaking of products – we used I would guess almost all of Detail Kings products, and they performed very well, it is unfortunate that I am located in the west coast of Canada so having to deal with customs, shipping, and exchange rate – perhaps that is something that Nick and I can work on together, as i would certainly use the products. The only suggestion I would make is in regards to the testimonials – I would only hold one session, That is just me as I am not a person who is comfortable in front of cameras. I highly recommend this auto detailing course to anyone thinking of entering or already in the detailing world. I also need to thank the group of students that I got to work with and meet – what an interesting, fun, and energizing group from all over the USA including Alaska. I wish each and everyone of them continued passion and much success in the business – I was a great pleasure to meet all of you. 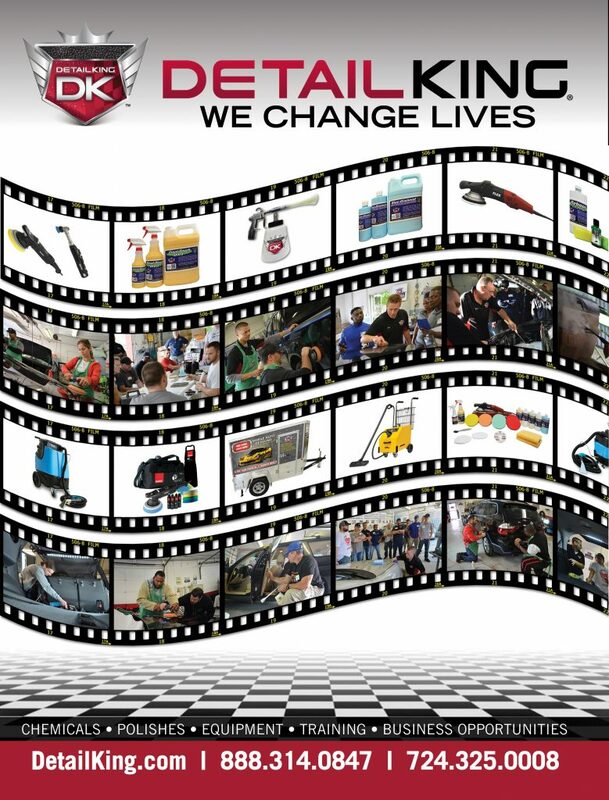 As an added convenience, we’ve created a comprehensive version of our 2018 56-page digital Color Catalog which showcases the many products that we offer for your personal use or business auto detailing needs. To get your copy, please select an option below, and we’ll get you started.